Quick question for clergy: What was your last Continuing Education event and how did it positively impact your ministry? Quick question for parishioners: What would you suggest to your pastors for their next Continuing Education event in hopes of positively impacting their ministry? Warning: These could be fighting words. Continuing education can be a flash point for some congregations and their leaders. If the pastor never takes classes to refresh and keep up with new ideas or if the pastor takes classes in theology and poetry writing but the parishioners wish the pastor would take classes in preaching and pastoral care, feelings will be hurt and shame storms might ensue. It’s painful when church leaders tell me that their pastor has no idea how to visit someone in the hospital, run a meeting, or preach a sermon – and they’ve been out of seminary for decades. Ouch. Who’s going to be the person who tells the 50 year old pastor that she could use a homiletics refresher course? Who’s going to tell the 61 year old pastor that his home visits are offensive? Every day’s a school day, as one of my favorite pastors often says, and this is true for every single one of us. Tenured teachers need to continue to learn how to teach. Seasoned physicians need to know the latest treatments. And experienced pastors need to improve our preaching/teaching/pastoral care/administration skills. God deserves our very best efforts. If pastors and congregations have a trusting, loving relationship, people can say to each other: “How can I be a more effective leader?” and the feedback will be honest. This goes for pastors, educators, elders, deacons, musicians, and choir members. “How can I be a more effective follower of Jesus?” is the most important question – but that’s for another post. Today I wonder about seeing Continuing Education through a Shaping Up lens. What do we need to work on? Maybe we need to shape up a little in terms of our professional and interpersonal skills. If we are too tired to consider this, listen to your soul. God might be telling us something. 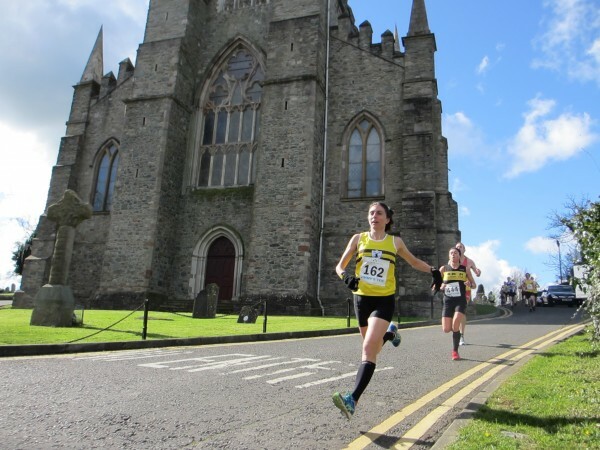 Image of Dr. Gladys Ganiel running by St. Patrick’s Church in Downpatrick, Northern Ireland. She blogs at A Church Without Walls. I just this month “reformatted” our Session meeting and determined that with 30 minutes of prayer & bible study plus 15 minutes of “vision casting” (I didn’t use that term but will from now on) we could still finish in a little over an hour by using a Consent Agenda instead of having every committee tell us what they did this month before telling us what they wanted us to vote on (both of which were already in their minutes). Our monthly meeting can be almost 1/3 shorter _and_ we can have had more meaningful discussions in our time together. We’ll see how it goes, but so far, people seem to like the idea. My last CE was at Menucha with you, Jan! I learned a lot there and have incorporated quite a bit into this transitional call. Part of what I learned in Week One was the importance of grounding Session in spirituality and faith. It is helping. As for the trains – I am still looking for them all!